IWC Frackuhr in Stahl, schönes Zifferblatt. Pocket watches have a large fan base. The timepieces range from cheap vintage models to extremely rare collector's pieces. World-famous manufacturers such as Patek Philippe have produced the most extraordinary pocket watches. Pocket watches have been beloved for centuries, especially amongst collectors and watch enthusiasts. Wristwatches almost made the pocket watch completely obsolete in the 20th century. Wearing a watch on your wrist is simply more comfortable for most people. Originally, it was predominantly men who used pocket watches. In order to not lose the watch, it was secured with a chain. There was a spring ring or clip at the end of the chain, which you could attach to a buttonhole. Men usually carried their pocket watches in their vest pockets , though they kept them in their pants or jacket pockets as well. Women often attached their pocket watches to a chain and wore them as necklaces. Manufacturers such as Tissot, Regent, or Dugena continue to produce affordable pocket watches. These are powered by mechanical or quartz movements. The number of pre-owned pocket watches available is much larger. The most highly sought-after models are vintage watches from the German manufacturer A. Lange & Söhne. Patek Philippe, one of the most renowned watch manufacturers in the world, is known for their especially intricate pocket watches. The Graves Supercomplication and Calibre 89 were the most intricate pocket watches for decades. If you're searching for a pocket watch, you have the choice between countless models. Prices range from a few hundred to a few million euros for very rare, intricate models. Apprentice watches are particularly special watches. They were made by watchmaking apprentices towards the end of one's apprenticeship, making them "journeyman's pieces." Watches from the 19th or first half of the 20th century are extremely coveted amongst collectors. Since there is only one of each watch, they're extremely scarce, and you should accordingly plan to spend at least 30,000 euros for such a rare piece. A less expensive entry into the world of pocket watches would be a model from Regent, Dugena, or Tissot. Pre-owned Tissot pocket watches cost less than 500 euros, although their gold watches can cost around 2,500 euros. All three manufacturers currently offer pocket watches in their portfolios. You can also find pre-owned pocket watches from the Swiss manufacturer Omega at affordable prices, sometimes for less than 200 euros. However, gold models can cost up to 4,000 euros. Pre-owned pocket watches from the International Watch Company (IWC) can be purchased for around 800 euros. Gold models, however, are available for 25,000 euros. 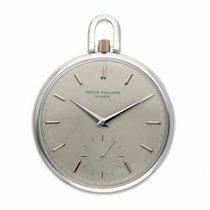 The prices for vintage pocket watches from Patek Philippe start at around 3,500 euros. However, there are also models that cost nearly one million euros. 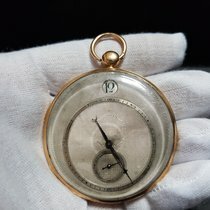 The Graves Supercomplication , a special order pocket watch for the American banker Henry Graves, Jr., sold at a Sotheby's auction in 2014 for 23.2 million Swiss francs (CHF), making it one of the most expensive watches in the world. The Patek Philippe 89 is slightly less expensive, although it's still one of the most intricate pocket watches ever produced. In 2009, it sold for around $5 million at an Antiquorum auction. Pocket watches have been around since the 15th century. The invention of the spring drive made pocket watches possible, as it enabled the entire watch movement to be miniaturized. Before then, large grandfather clocks were powered by weights attached to chains which wound the movement. The oldest known watch with a spring drive dates back to 1430 . It features a fusee, which equalized the uneven pull of the mainspring. This watch belonged to Philip the Good, Duke of Burgundy, and is on display at the Germanisches Nationalmuseum (Germanic National Museum) in Nuremberg. Peter Henlein, a locksmith from Nuremburg, was one of the first to use a spring drive together with an escape mechanism in a wearable watch. He was able to get the watch down to pocket watch size using this construction, and the shape of the timepiece resembled a can . One of these models is on display at the Germanisches Nationalmuseum in Nuremburg. The German town of Nuremberg was the center of watchmaking in the 15th century. Historians know it as the "Silicon Valley of the Middle Ages" due to the many inventions made in the town. These can-shaped watches, which were most likely carried in bags, eventually developed into wearable watches fashioned onto chains. Since the first portable watches still weren't very accurate, they only had an hour hand. This changed in the mid-17th century when better escapement systems were developed, resulting in portable watches with both hour and minute hands. The majority of older pocket watches are unsigned, as adding company names and logos wasn't common practice until the 19th century. Sometimes you're only able to tell the origin of a watch based on its construction, design, or decorations. In the 16th century, pocket watch cases were often spherical or box-shaped. Over time, the case developed into the common flat design we know today. Pocket watches are classified as either Savonnette or Lépine, an important distinction. The Lépine version is named for the French watchmaker Jean-Antoine Lépine. In this construction, the seconds display, winding stem, and crown are all in line with each other. Lépine pocket watches have no spring cover, and thanks to their construction, they're especially flat. This makes them well suited as tailcoat watches. Savonnette watches, on the other hand, have a spring cover protecting the dial and watchglass which can be opened by a push-piece. The term "Savonnette" comes from French and means "little bar of soap." Savonnette pocket watches have the seconds display at six o'clock, and the crown is on the side at three o'clock. This construction makes it easier to hold and use: You can hold the pocket watch in your right hand and use your thumbs to operate the spring cover push-piece and read the time. Pocket watches can do much more than just show the time. The most intricate pocket watches come from the Swiss manufacturers Patek Philippe, Breguet, and Vacheron Constantin. With a total of 24 complications, the Graves Supercomplication held the record for the most intricate pocket watch for decades. It features a perpetual calendar , double chronograph for timing intervals, and astronomical displays . The watch shows the normal time, sidereal time, the sunrise and sunset time, and the starry sky over New York City. The Graves Supercomplication was custom made for the New York banker Henry Graves, Jr. , a passionate watch collector and Patek Philippe fan. The American car manufacturer James Ward Packard was also a lover of rare Patek Philippe watches. Both men commissioned many watches from Patek Philippe with the goal of beating one another in acquiring the most intricate timepiece. The competition ended with Henry Graves, Jr.'s Graves Supercomplication. Originally commissioned in 1925, the watch was finally completed seven years later in 1932. It took a further 12 months for the watch to reach Graves. Since Packard died in 1928, he was unable to commission any more pocket watches. Therefore, it remains a mystery whether Patek could have made an even more intricate watch than the Graves Supercomplication in the early 1930s. Patek Philippe's Calibre 89 overtook the Graves Supercomplication as the most intricate watch in 1989. With a total of 33 complications, the Calibre 89 set a new record. Among its complications are a double chronograph, perpetual calendar , a moon phase and age display, and a second time zone display . There are also many astronomical displays on the back side of the watch. The pocket watch also has acoustic complications such as a grand and petite sonnerie, a minute repeater, and an alarm function. Patek Philippe only produced four Calibre 89 pocket watches. In 2015, the Swiss manufacturer Vacheron Constantin set a new record. Their pocket watch, reference number 57260, has 57 complications. Vacheron Constantin produced this watch for a wealthy, anonymous customer. The watch features many calendars: a Gregorian perpetual calendar, a Hebrew perpetual calendar, an astronomical calendar function, and a professional business calendar based on the ISO 8601 standard. The Breguet pocket watch Grande Complication No. 1160 is, like its predecessor the No. 160, a rarity. An unknown admirer of Marie Antoinette commissioned the watch in 1783 when Breguet was the purveyor to the royal French court. Marie Antoinette was known to be a fan of Breguet. The watch was meant to showcase the watchmaking know-how of the time, and gold was used in lieu of other metals when possible. The automatic watch features a perpetual calendar, minute repeater, and a power reserve display. It also displays the equation of time, the daily deviation between the true and mean solar times. The mean solar time is the time we use day in, day out. Breguet finished the watch in 1827, 44 years after it was commissioned. Marie Antoinette had already died 34 years earlier. The No. 160 pocket watch was on display in a Jerusalem museum until 1983. It vanished without a trace and remained lost for 24 years, until it reappeared suddenly in 2007. Nicolas G. Hayek, the founder of the Swatch Group, commissioned Breguet to remake the No. 160 in 2004. Since the original was still missing at the time, the watchmakers had to reconstruct it using old drawings and reference documents. Abraham-Louis Breguet was the founder of the manufacturer and is considered a genius master watchmaker. He is the inventor of the tourbillon, a complication which minimizes gravity-related deviations and ensures the watch runs precisely.